Disney Store Pixar Cars 2 Launching play set Lightning McQueen Lewis Hamilton Jeff Gorvette Memo Rojas Toys. New 2014 Cars Crashing and Parts Fly off on impact & snap back on! Lightning Mcqueen Crashes into Lewis Hamilton while Jeff Gorvette's wheel breaks off. These Disney Cars Launchers can withstand a lot of smashing and crashing with minor results to the paint or pieces attached to the cars. Rampe de lancement de course cars Les pieces s'ejectent et se remettent en place. Check out more of our Play Doh Videos by Disney Cars Toy Club below! 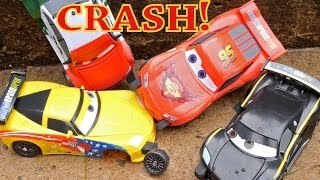 Disney CARS Toys Movies - Lightning Mcqueen is Back!